Imagine a day where you no longer need to struggle with the decision of which density cellular foam to use on every color of every new job; that day has come! Customers report back that on average 75% of every color printed using ChannalBAC shows an improvement versus when printed on cellular foam; and the print results on the remaining 25% are comparable to what they achieve using their best cellular foam option. Controlled Displacement Technology is unlike any cellular foam. Our patented design separates the elastomeric membrane from the air, resulting in a spring like cushion that allows a single product to be used on all colors of every job without compromise! 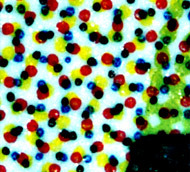 It is designed to allow you to replicate the density of any cellular foam simply by increasing impression. In addition, ChannalBAC provides dynamic dampening capabilities beyond the capability of cellular technology resulting in reduced plate cleaning, a reduction or elimination of bounce, while in most cases providing significant increases in press speed. Throughout the development process we have had the opportunity to work with many leading Flexo printing facilities. When asked how they like their current mounting tape the response is typically the same; we've got the best options available , (pointing to more than a half dozen different density rolls on their shelf) and that's where the variables begin. 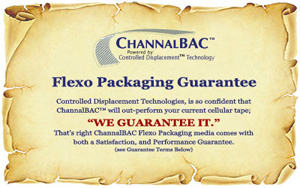 ChannalBAC is designed to be a drop-in replacement for 0.020" tape. 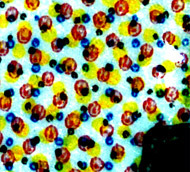 What that means to you is that you do not need to change graphics, no new fingerprints, no changes to your cutback curves; just different techniques in your mounting department. 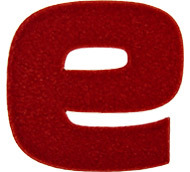 In fact, there is no need to change any existing technology that you use except your cellular foam. Our newly improved differential adhesive system makes ChannalBAC easier to apply to the cylinder/sleeve than cellular foam, and when the job is completed, the plate removal is as easy as when you removed the release liner from ChannalBAC itself. The small adhesive footprint of the ribs, combined with the dimensional stability of the plates side membrane makes removal from the cylinder/sleeve a snap. Above are examples of customer's actual savings... with the same results, how many dollars will ChannalBAC save you? Flexo Packaging printers have confirmed what the Flexo Newsprint segment has proven; ChannalBAC is "CRUSH-PROOF." It's GUARANTEED to maintain its Resilience and Gauge throughout your longest press runs! ChannalBAC is currently available in .020 gauge in 18" X 25 yard rolls, and can be made in custom widths. Don't take our word for it, order your RISK FREE trial today, and test-drive it yourself...! 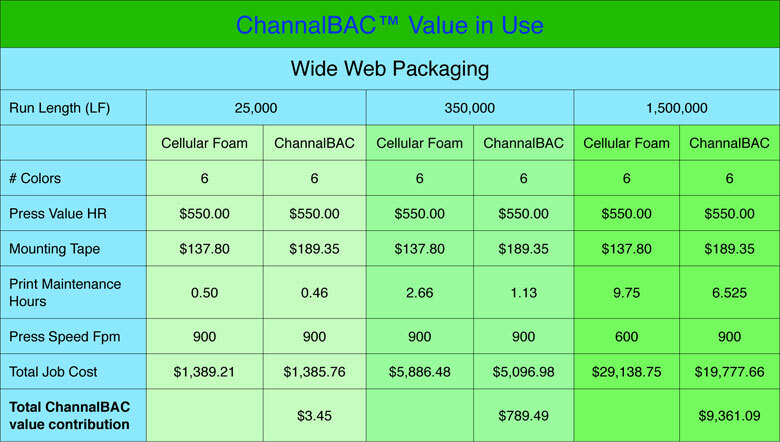 The bottom line, ChannalBAC is not another iteration of cellular foam it's a Game Changer! "improve the quality and consistency of the product you deliver to your customers". most to you, your press room!